Just a short post to highlight some thoughts about the little things we do that add up to make a big difference. These little things surround us all day, every day and have a profound effect on our lives. There are so many that it is hard to really list or identify each and every one but there are a few that spring straight to mind. Sometimes the little things come into focus. 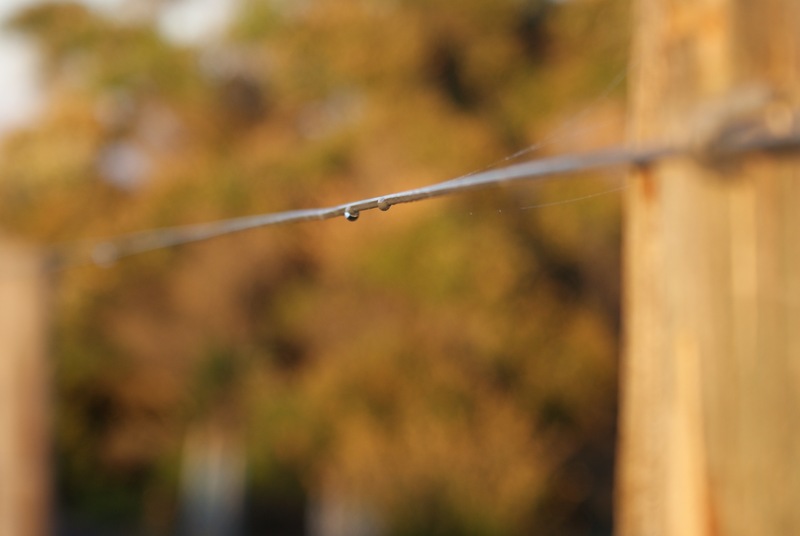 Like these beads of water on a wire. Work – Whatever our workplace environment is like there are often repetitive tasks that we perform. Under normal circumstances these tasks do not cause us any undue discomfort or irritation. However, when we have a fall in technique or our body is compensating for a weakness we often overload other parts of the system and our bodies way of interpreting this is pain. Sport – Sports usually rely on technique and being able to perform simple tasks “the basics” over and over again with slight alterations. The ability to perform these tasks takes time and practice which allows our brains to hardwire a program, which in turn makes doing these tasks quicker and more naturally. A great example of this is the ease of throwing a ball with your preferred and non-preferred arm. If you practice with your non-preferred arm, over time that movement will become more natural as our brains learn the sequence of muscle control and activation. Again, if we are preforming these actions in a way that places extra stress on our bodies, that can cause compensation and may end up presenting as an injury. Normal actives of daily living such as driving, cooking, gardening and walking can all become aggravating or maintaining factors for injury if there is an aspect of the task that is being completed in a way the body doesn’t not like. Its these things that we ask about and try to identify in your consultation as we believe that when everything is moving and acting as it should, the risk of injury will be low and you will be more efficient and effective. This rings true be it work, sport or simply part of your everyday routine. Sometimes its not the major event, but all the little ones that we need to address. bodies way of interpreting this is pain.